London is the direct focus this month for the 'Mission to the Cities' initiative of the worldwide Seventh-day Adventist Church. London is the direct focus this month for the 'Mission to the Cities' initiative of the worldwide Seventh-day Adventist Church. After months of preparation, outreach programmes are running in Brixton church as well as Youth Missions in several venues across London. The Brixton programme started with a full house on Sabbath, 5 October. The speaker, Pastor Kelby McCottry from the USA, is focusing his sermons on Hope. By looking at different Bible characters, such as Samuel or Solomon, Pastor McCottry is enthusiastically guiding his audience to discover their need for hope. The congregation is mainly members and visitors from Brixton, Balham and Croydon churches. 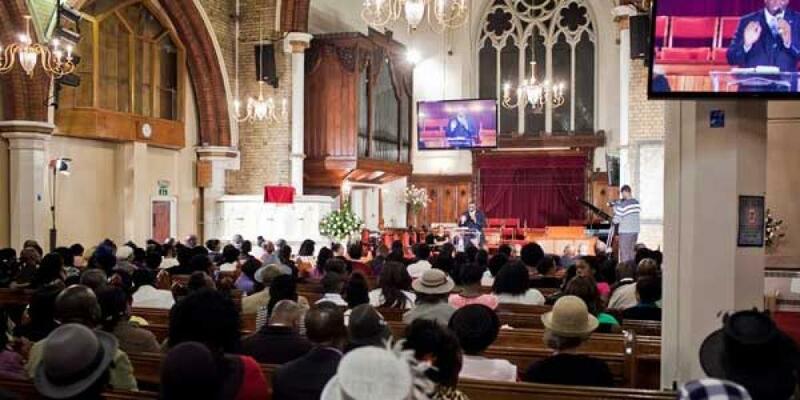 Pastor Vili Costescu has been tasked by the Division to ensure media coverage, and has been working to set up the streaming service for Brixton so more people can watch the programmes. "It's good to make the programmes available for more people", Pastor Costescu stated. "We are averaging about 50 people who watch online, but I expect the numbers to rise over the weekend." The programmes are streamed via the Brixton church website or direct fromStreamkit TV. The programme runs daily (except Thursdays) at 7:00 pm until 19 October. Simultaneously, around 200 youth under the leadership of Pastor Steve Thomas, started their restaurant style meetings in the Advent Centre. "It's been an amazing atmosphere", expressed Pastor Thomas, "I'm excited it's going so well." Following a three course meal, it's an evening of music by the London Youth Federation and a relevant sermon. The speaker this week was Pastor Rebecca Davis from Atlanta, USA. Under the theme, 'What's love got to do with it', she spoke about real love, great dating and a young person's future. Connecting well with the audience she said, "I'm impressed to see the youth here. They are very opinionated, engaged and talented. It's a group on fire for God." There are challenges as Pastor Davis noted, principally "they are wondering if there is a place for them in the church." SEC Teens director, Pastor Dejan Stojkovic, attended the opening and was impressed how Pastor Davis was able to speak straight to the youth in a language they understood. "I want to bring her over for the teens", he said. "It was a great evening with spiritual and physical food as well as outstanding fellowship" added Zinze Bishop. "We were excited to see people from the community coming in on Sunday." The youth are bringing in different speakers, as well as visiting several different churches midweek and Sabbaths throughout October ending on 2 November. For more information and up-to-date schedule please visit the SEC Youth Facebook page. Mission to the Cities – London, is more than a month of meetings. Two long-term church plant projects in Uxbridge and Potters Bar are building up work in their communities. At the moment they are conducting research and meeting the community to discover how best to make a difference in people's lives. Volunteers have been recruited to help with the project.